Ross explained to her that a dog without a tail has great difficulty in communicating with other dogs, because a tail is such a vital tool of communication in many animals. Consequently, it was as if he had lost his voice. Also, the other dogs found the tri-paw strange, both to look at and to smell -- his stumps occasionally bled and smelled of disinfectant -- so they tended to avoid him. To make matters worse, Haatchi also suffered from what is known as "ghost limb" for a while, in which he thought that his missing leg was still there. He'd try to scratch himself behind the ear with it and only end up jerking his stump before whimpering in frustration and pain. When he finally settled into Colleen's lap, he rolled on to his back and presented her with his leg stump, which was shaved bald and red raw with stitches in it. She asked him gently, "Can I touch it?" and he didn't seem to mind, so she placed her hand on it and discovered it was really hot. That's when he completely curled himself around her. All of a sudden James nudged Ross and said, "Look!" Haatchi's odd little stump of a tail was wagging -- the first time he'd moved it since he went to live with them. Up until then, they told her, they didn't even know if he could. "From that moment I was sold," Colleen said later. "Haatchi had chosen us, not the other way around. There is something truly spiritual about him. I was in love and I knew in my heart that we belonged to him." When Colleen got home later that night she burst into tears as she told Will how incredible Haatchi was and how sad she was about what had happened to him. The couple had two weeks to consider whether they were truly prepared to take on such a large, three-legged animal. They needed to be sure they were doing the right thing and for all the right reasons. Owen was Will's priority. He needed to be convinced that a dog who had suffered such cruelty would be safe around his son and he told Colleen that if there was even one growl, then Haatchi was out. Once they'd made their decision to take Haatchi, they had to pass a UKGSR home check before Colleen would be allowed to collect him. They were a little nervous as their home was inspected and they were asked questions about where Haatchi would be kept and how long he might be left on his own during any given day. Only when they were informed that they had passed the home check was Colleen able to drive back to Oxfordshire to pick up their new baby. Owen has always loved secrets and surprises, so the couple hadn't told him anything about who was coming to live with them. He was fast asleep in bed by the time Colleen got home with Haatchi late on the night of 18 February, so they closed his bedroom door and let their new dog limp around the house to explore. Then they introduced him to Mr Pixel. Just as they'd hoped, the two dogs got along well and Haatchi showed none of the characteristics so often cited about his breed. After he had explored every corner of their house and worked out where everything was, Haatchi kept returning to sniff at Owen's bedroom door, so they opened it quietly. In spite of his injuries, Haatchi -- who was still only five months old -- was an exuberant puppy, even if one with only three legs. Up until that point, he'd been slipping and sliding all over the house and getting overexcited. The moment he stepped into Owen's bedroom, decorated with Star Wars and Toy Story murals, all hand-painted by Will, his demeanor completely changed. As soon as he saw the oxygen mask and the flow machine he sniffed the air repeatedly and almost tiptoed across to where Little B lay. Will and Colleen watched as he tilted his head, as if to say, "Hmmm, there's something interesting here." It was if he knew this was a vulnerable little boy and that the machinery and tubes were a no-go area for him. Then he silently backed away. The following morning, Will woke his son at 7 a.m. and sat on the edge of the bed as his little "sleep slug" rubbed his eyes and yawned. Will told Owen they had a big surprise for him, and that made him wake up very quickly and become very excited. Then Will invited Colleen to bring Haatchi in. Owen's mouth fell open as a dog three times his size lolloped over and, without any encouragement, placed his head calmly and quietly on Owen's leg. They took one look at each other and each of them melted. It was love at first sight -- for both of them. Colleen said later that the whole atmosphere in the room changed in an instant. "It was utterly electric -- a combination of pure love and acceptance. It is hard to describe the connection between the two of them. It was as if they were reconnecting -- like old friends meeting each other again, rather than for the first time. I only wish I'd had a video camera to record the moment." What Will found so interesting was that neither boy nor dog backed away from each other or appeared to be in the least bit fazed. Both seemed to realize that there was something unusual about the other. 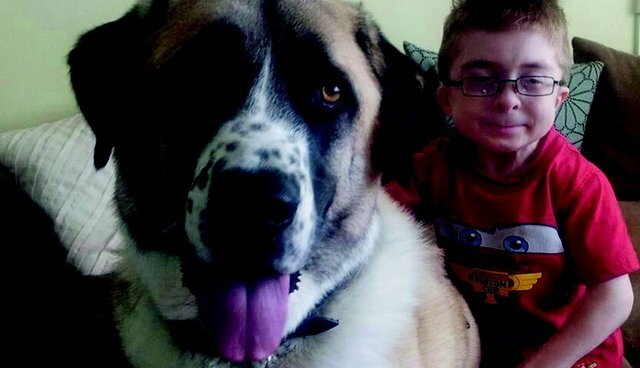 Haatchi wasn't perfect and he wasn't normal, but Owen could see that, although he was so big, he was just getting on with being disabled and didn't let it bother him. Will thought that really struck a chord. Owen asked what had happened to Haatchi's leg and tail. They didn't want to lie, but it was a hard story both to tell and to hear. Little B cried as they explained as best they could, and all the while he carried on stroking the dog's big head. Overcome with sadness, he asked why anyone would be so cruel. Will and Colleen told him they didn't know, but assured him that the police would catch the person and tell them off. That made him feel a little better. He got himself up and into his walker and wandered into the living room as Haatchi followed devotedly behind. The two of them curled up together on the sofa, where Owen stroked his new friend some more and began to whisper in his ear. The bond that was forged between them that morning is something that only they will ever understand. For the rest of that weekend boy and dog lay together -- in bed, on the sofa or on the floor. Already they were inseparable, and Will and Colleen both knew that Haatchi was there to stay. "I felt really happy," Owen said later with a smile. "Everything changed in my life that day." Haatchi had been fed a raw-food diet at Dogs and Kisses and, having read several articles about it being healthier and more natural for dogs, Colleen and Will decided to switch to raw food for him and Mr Pixel. Colleen looked up various companies online and found one called Natural Instinct not too far away in Camberley, in Surrey, so she ordered what she needed from them and asked Will to find them a chest freezer on eBay to keep it all in. He eventually located one but it couldn't be delivered for a few days, so Colleen rang Natural Instinct back and asked them to postpone the delivery. When the lady at the end of the telephone asked why and she explained about the freezer and told her about Haatchi, the stranger was touched and asked to see a photograph of the three-legged dog they were rescuing. An hour later, Colleen and Will received a call from Suzanne Brock, sister of company director David Brock, who told them they'd like to sponsor Haatchi and give him free food for life. Colleen couldn't believe it; she was so shocked she burst into tears. It was an incredibly generous gesture. Little did they know then just how much Haatchi's story would touch people in ways they could never have imagined and lead to so many future acts of kindness. Because she had found Haatchi via Facebook, Colleen had decided it was only right to set up a special page for him. For his first few entries, and describing the day that Colleen first met him, Haatchi "wrote": "Feb 14 -- Happy Valentine's Day! It is even more special for me as today I secured my forever home! Bring on the love!" He described himself as a "comedian, entertainer and self-employed psychologist." Under "Education" he said he studied surviving being hit by a train after being deliberately tied to the track at the "University of life and hard knocks." On the dateline for February, he wrote: "Left job at RSPCA -- survival specialist," adding that he took "a crash course in the diversity of the human race, ranging from people determined to murder me, people who fought to keep me alive, through to people who want to enrich my life both physically and mentally for ever." From Haatchi & Little B by Wendy Holden, on sale July 1, 2014, from Thomas Dunne Books, an imprint of St. Martin's Press, LLC. Copyright © 2014 by the author and reprinted by permission of St. Martin's Press, LLC.